We were up till midnight last night. Well, I was up till midnight. It was 12:07 when I plugged in my phone and I’m pretty sure I disappeared into a Benadryl-induced coma shortly after that. Propped up in bed, headphones in your ears, you were editing “um’s” out of our podcast a mere four hours before it would go live. You messed around with the pre-ad music for a while before finally whispering, "I think it sounds pretty good." I caught you smirking a few times, probably around the mark where us girls were discussing bras and monthly cycles. You joked that you know too much about the writers, and I laughed because it’s true. Everyone is excited the podcast is back today. They have no idea you put in five whole hours on that episode last night, or that you spent an entire Monday evening making our voices sound much more polished than they really are. Almost everything you do for this cause, for this tiny dream of mine, is done in secret. I know how much you love to be anonymous, but there is a time to be incognito and a time to be seen, and today is the latter for you. Today I want to tell people how much you do behind the scenes. I want them to know that when our website is acting up, you always know how to fix it. I want them to know that all I have to do is draw a picture on a napkin and you know how to magically translate my chicken scratch into code. I want people to know that in the midst of working on The Year of Creativity, I hit a button called "reset default" and accidentally broke our entire website with a single click. I undid hours and hours of work you had done on our Squarespace template in exactly one second. I want to tell people how in that moment, you did not panic in the slightest, but instead, you grabbed a Dr. Pepper from the fridge, rolled up your sleeves, and rebuilt our entire website from memory in one hour. I want to tell people that every time I say, "I have an idea," you say, "That's a great idea." I want to tell people how you take the kids to the park whenever I need to write, and that you held down the fort on five separate weekends last year while I escaped to a B&B to work on the book. I want to tell people how much room and space you’ve given me to pursue this passion, even when it hasn’t made us any money. I want to tell people how much you don’t care about the money, and how because this is my passion, it’s become your passion, too. I want to tell people that my dreams are your dreams, and the minute something is important to me, it becomes important to you. I was all of 20 years old when you slipped a diamond on my finger, and I couldn't have possibly known how much I would need this quality in you to do anything I have accomplished in the almost decade we've been married. I want to tell people that you brought our book into your office and proudly showed your coworkers. I want to tell people about that one time we were at Bandera for dinner and you told the waitress all about Coffee + Crumbs. She mentioned she had young kids and the words came flying out of your mouth before I even had a chance to blush. I want people to know that sunbeams practically shine from your face when you talk about me, and when you talk about my work. I want people to know that chasing a dream is not easy or effortless, for the person chasing the dream or their spouse. I want people to know that the book was stressful on our marriage and that one night we screamed at each other in the middle of our bedroom. (I also want them to know we went to therapy and worked it out, and apologized and forgave one another like we always do.) I want people to know that sometimes sacrifice leads to resentment and that our marriage is not immune from this combination. And yet: for every time this work has been a stressor on our marriage, it has been a gift and blessing 100 times over. How many times have we laughed and celebrated and praised God and pinched ourselves because who ever thought a simple blog could turn into all of this? I want people to know that as soon as the book deal was real, I knew I would write one whole story for you, for us. I want people to know that that essay was the easiest one to write, the one about us. I want people to know that this blog, this podcast, this book, this dream, would not exist without you. Behind the scenes, you have picked me up off the floor more times than I count. You are the constant force of confidence breathing life into me when I am drowning in insecurity. You’ve never doubted me. You’ve believed in this mission from the very first day. 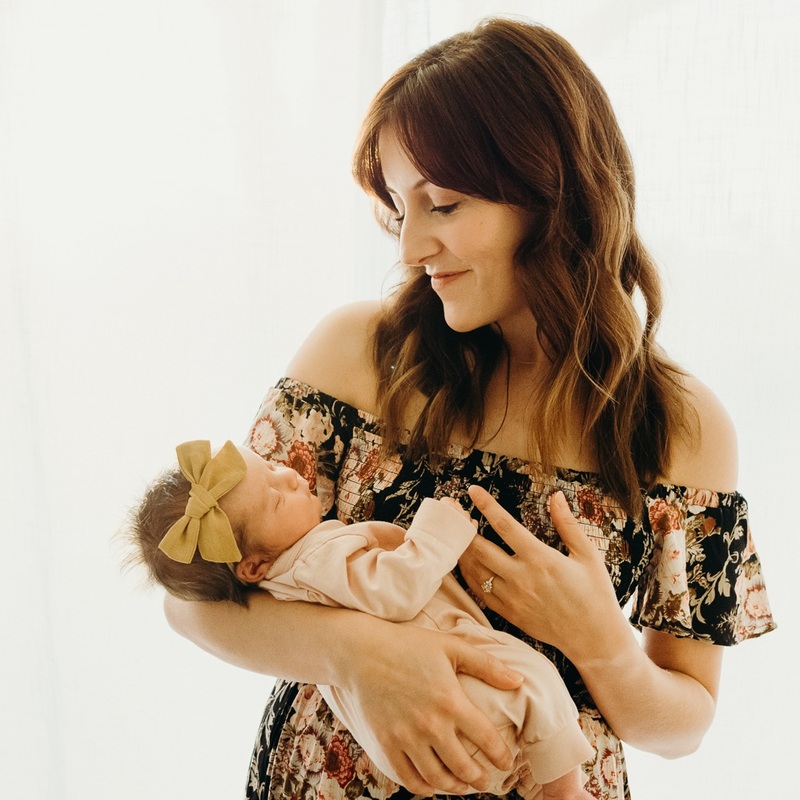 You’ve been the backbone and my greatest support system from the moment I first uttered the words, "I think I want to start a collaborative blog about motherhood." None of this would be possible without you. And today I want to publicly thank you -- on behalf of myself, on behalf of the other writers, and on behalf of any person who has ever benefitted from the work of Coffee + Crumbs. You play a role in this work, and it's not a small one. Thank you for taking my dream and making it your own. Truly, it's the best gift you've ever given me. I ask the same questions every time. "How was your day, sweetheart?" "What did you learn about?" "Who did you play with?" "What did you have for snack?" The ride home from preschool is only four minutes long, so we stick to the basics. His answers are usually the same: his day was good, he forgot what he learned, he played with Benjamin and Isaac, he had apple slices and popcorn for a snack. Occasionally he mentions something specific -- a game they played, a song they sang, a worm spotted in the dirt. But generally speaking, his answers are as predictable as the questions I ask. That is, until he mentioned Caroline. My eyebrows went up as I glanced at him in the rear view mirror. Who's Caroline? Benjamin and Isaac are 2/3 of the boy posse that Everett's been a part of for two years. He's never uttered a word about playing with anyone but them ... let alone a girl. But there it was, a new answer to the old question. "I played with Caroline today. She is sooooooooo funny, mommy." I was intrigued, but upon further investigation, didn't learn much. They played in the sandbox; no big deal. We moved on to the topic of snacks (he opted not to eat carrots that day). Little did I know, Caroline would become a household name in the following weeks. Caroline this, Caroline that. His face lit up like a Christmas tree when he talked about her, a crush if I've ever seen one. But is it too soon? He's only four. My suspicions were confirmed the day before the Valentine's Day preschool party, when Everett seemed especially concerned with which valentine Caroline would receive. We sat around the coffee table together Sunday afternoon. I cut printable dinosaur valentines, while he carefully wrote "Ev" on each one. "Mommy, I want to give Caroline the purple one, because Caroline loves purple," he told me. I nodded and handed him a purple valentine. He smiled while writing "Ev" along the bottom. "Mommy, do you think I can put a special sticker on Caroline's?" "Sure, babe ... what kind of sticker?" "A flower sticker, because Caroline loves flowers." This was the extent of my knowledge of Caroline: she liked purple, she liked flowers, she had a good sense of humor. Well, and my son was smitten with her. We finished the rest of the valentines, attaching red suckers to the back of each one with decorative tape. I got up from the table to get ready for a yoga class, but not before Everett grabbed Caroline's valentine and told me he "just wanted to hold it" for a little while. The next morning, in our typical rush to get out the door, I was zipping up my jeans with a toothbrush in my mouth when Everett asked if he could wear hair gel. Everett never asks to wear hair gel. "Why do you want hair gel today, Ev?" I asked. "Because I want to look handsome for Caroline," he said with a bashful grin. What's a mother to do? I obliged. We arrived at preschool a few minutes late, and I walked in with him to help put the valentines in the kids' bags. Carson made himself at home near the train table while I walked from bag to bag with Everett, reading the name of each student to him. "This one is Benjamin's ... this one is Jake's." Everett reached into his bag of valentines and made thoughtful choices. He told me which kids would like a T-Rex best or which kids preferred blue. And then we got to Caroline's bag. I fished out the special valentine with the flower sticker and Everett held it carefully in his hands for 10 whole seconds with a dopey smile on his face before dropping it in her bag in slow motion. When the last valentine had been delivered, Everett whispered to me, "I'm going to go find Caroline!" I carried Carson out to the parking lot on my hip, but not before noticing Everett standing next to the playhouse with a little girl in pigtails. She was wearing a navy blue shirt with a pink heart. Aha. I tried to gage the situation. Everett clearly adored her, but did she adore him back? Was the feeling mutual? Did she talk about Everett to her parents, too? My heart ached at the possibility of a one-sided crush. When I returned around 11:25 for the valentine party, the kids had just finished their cookies and milk. Everett waved at me before pointing to Caroline on the swings and running to join her. I watched them swing in unison, rays of sunshine beaming off the tops of their dirty blond heads. I snapped a picture for his preschool yearbook. She hopped off eventually, and so did he. They parted ways for a few minutes; Everett joined a friend on the seesaw and she sat down at a picnic table with another kid. At 11:50, Mrs. Brown rang the bell, signaling that it was time to come back inside to gather backpacks. Everett leapt off the seesaw and sprinted to the picnic table. I watched in amusement as he waited for Caroline to get down so they could walk inside together. When we got home, Everett couldn't wait to dump out his valentine bag. He turned it upside down and let all the valentines fall to the floor as Carson let out an excited, "Wooooooow!" Together we sifted through tiny cards, candy, crayons, and small bags of goldfish crackers. I knew what we were all looking for, even before he asked. "Mommy, which valentine is from Caroline?" In a sea of Paw Patrol and Minions store-bought valentines, hers stood out among the rest. A simple pink heart, with a red heart glued in the middle. Simple. Handmade. No candy attached. Well played. I handed it to Everett and watched his face light up. I couldn't help but wonder again: is Caroline looking for Everett's valentine right now? Did she notice the sticker? He carried that valentine around for the rest of the day, stopping to stare at it any chance he got. When all the candy had been eaten, I threw away the bag full of valentines, but not before placing the pink heart in Everett's memory box. He has a lifetime of falling in love ahead of him, and I know he won't always confide in me. Keeping her valentine is just as much for me as it is for him: to remember this first crush, when he was only four and asked for hair gel and wasn't embarrassed to tell his mom all about a girl. I guess the feeling is mutual. This post was inspired by a writing prompt from The Year Of Creativity. Want to join us? Use ASHLEE15 to save 15% off here. Every month comes with a lesson prepared by a C+C writer, writing prompts, creative exercises, and more! Better late than never (my personal memory keeping mantra). Can I confess something? Memory keeping stresses me the heck out. I have so many goals, so many ideas, so many plans......baby books, photo books, memory boxes. Everything is unfinished; I am always behind. However. The one thing I have managed to do (albeit late, always) is put together a video of my kids on their birthday. My digital files are half organized, half plopped into a folder called To File, so I figure this way: if my house burns down, I'll still have the best video clips of my kids' childhoods saved in cohesive movies once a year. Thanks, Vimeo. And with that, happy 4th birthday to my sweet Everett! He brought home a glowing report on his preschool evaluation, and just last week one of his teachers stopped me at drop-off to tell me what a joy it has been to have Everett in her class. I may have shed a tear (hey hormones). Everett: you are a joy at preschool, you are a joy at home, you are a joy (almost) always. I love the sweet and considerate boy you are turning into, and could not be prouder of how wonderfully you've handled your role as big brother. You make every room brighter, and I pray you never stop saying "hi!" to strangers on the street. Your smile is contagious, and I love watching you interact with the world. I love you forever. Everett Turns Four from Ashlee Gadd on Vimeo. And to think someday they will grow up and get married and someone else will call them valentines. SOB. p.s. Real talk: Carson is 16 months old and I feel like we are just now getting the hang of two kids. I'm writing about sleep deprivation and marriage and co-parenting and grace over at Coffee + Crumbs today. on splinters, tonsils, ear tubes, and trust. "Mommy, I got some-fin in my foot!" It was five minutes till bedtime, not like I was keeping track. (Okay, let's be honest: I am always keeping track). His dirty blonde hair was still wet from the bath, and a post-dinner belly protruded from the top of his spaceship pajamas. "What's in your foot, buddy?" I asked. I pulled him towards me, and he sat down in my lap as we both examined the foot in question. Upon further investigation under his teepee twinkle lights, I spotted a splinter. No doubt, the result of him playing barefoot at the park a few hours prior. "Sorry, buddy, you have a splinter in your foot. Mommy's going to have to get that out for you." He looked at me, wide-eyed, unsure how to respond. I cautiously explained the removal process: that I would have to use tweezers, and that it would pinch a teeny tiny bit, but it wouldn't hurt. He seemed skeptical. We migrated to my bathroom for tweezers and better light. Panic set in. "No mommy, I don't want to!" he cried. I reassured him over and over again that I was going to help him, not hurt him, but as things like this normally go with three year-olds, he was quickly flailing about on the bathroom floor like a fish out of water. I looked to my husband for reinforcement, and within seconds he was contained in his daddy's arms. I grabbed the affected foot and gave careful instructions, "Everett, mommy is going to take the splinter out. Be very still. This won't hurt, I promise. You have to trust me, okay?" He looked suspicious. Slightly terrified. The weight of my own words echoed in my mind. Does my own son not trust me? Have I ever given him a reason not to? Just when I thought I had screwed everything up, counting the number of times I've said, "this won't hurt" or "we'll do that next time", a single tear rolled down his cheek and I watched his body exhale. He relaxed into my husband's arms, and waited for me. I squinted, and carefully removed the splinter in one quick motion. He didn't even flinch, my brave boy. "All done!" I exclaimed proudly. He smiled as a wave of relief washed over him, a fish falling back into water. My husband released him to the floor, where he immediately ran his fingers over his foot and looked at me, bewildered. "It's gone! My foot is all bed-der!!!" "I told you, buddy. Mommy will always take care of you, okay?" I gave him a kiss on the cheek and that was it, a lesson in trust. Everett is having his tonsils and adenoids removed this morning, as well as tubes put in his ears. We are all up before the sunrise. This is early, even for us. I've packed his Elmo and blue blanket carefully in his backpack. I bought him a new Lightning McQueen sippy cup so he can stay hydrated in style after the procedure. I know he needs this. But when I picture the needle, the anesthesia, the cutting, the blood, I can't lie---I get a little lightheaded. I'm not an anxious person by nature. I'm the "relaxed" one in our family. But this morning, I can't help but feel a tiny bit panicked. On the outside, I'm cool and calm and collected, but on the inside, I'm just like Everett staring at the tweezers. Suspicious. Slightly terrified. A fish out of water. The doctor said he will be fine afterwards. "It's a very basic procedure," he told us. He's probably done this hundreds of times. This morning I will sit back, and I will try to relax, and I will be brave for my boy like he is brave for me. I'll say a prayer. I will kiss his cheek before they wheel him away, and then I will wait. Wait. Wait. In keeping with the "second baby" cliche, I am one whole month late on blogging anything for Carson's birthday. We had a sweet, small party, complete with Chipotle and margaritas and no less than 100 tears shed from the birthday boy. Between major separation anxiety and a tooth cutting through, it was not his finest hour. I staged more photos a few days after his birthday because HELLO CUTE BANNER. Turns out, he was willing to oblige with an audience of one. Naturally. Here's a little tribute to the first year.....we love you Carson! to my baby boy on his first day of preschool. We made it. We did it. You and I, buddy. We survived 3.5 years at home together, and that was no small feat. By my calculations that’s something like 8,491 diapers changed and 1,542 goldfish crackers consumed, 981 times I have buckled and unbuckled you out of your carseat, and 3,872 kisses I have planted on your face (approximately). Our days have been filled with stories and toy cars, water tables and playdates. We have laughed and cried and thrown tantrums regularly, and I have loved watching you grow into the sweet, independent boy that you are. You are getting ready for a new adventure now, one that is completely separate from me. While I can vividly imagine you stuffing your Lightning McQueen backpack into a cubby and sitting on the floor waiting for music time, the truth is: I won’t know exactly where you'll be or exactly what you'll be doing during those hours. You’ll make new friends and learn new things, and my entire knowledge of this experience for you will boil down to what you decide to share with me in the car on the short ride home. Preschool feels like a bookmark between two chapters, the place where one story begins and one story ends. It’s the very definition of bittersweet. I want you to know that these last 3.5 years have been the very best for me, Ev. Even in my ugliest, most impatient, most frustrated moments with you, these years have been the very best. It's hard for me to even pinpoint definitive memories, because there are so many, but also because when I think of these years, my mind wanders more to a feeling than a specific time and place. My mind wanders to the feeling of home, and warmth, and joy abundant. That's how I think of you, Ev. Thinking of you is thinking of home. I can barely even remember a time when our home didn't consist of you and your infectious laugh and your cheerios on the carpet and hot wheels neatly lined up on the coffee table. I hope your first day of preschool is everything you want it to be and more. And I hope you remember that no matter how big you get or how smart you become, you will always be my first baby. I am so proud to be your mom. On Saturday night we met my friend Lee at the river preserve for our annual family photos. We wrangled the kids, stashed the car with m&m bribes and emergency extra clothes, and hoped for the best. Being a photographer myself, I had scheduled the shoot during the golden hour, which of course coincides with bedtime. Call me crazy, but I'd rather deal with meltdowns than bad lighting. Just like every year, I was quick to request photos of Brett and I as well. I like the reminder that our marriage is a separate entity, a force to be reckoned with. A few times throughout the evening, we strapped the boys in the stroller and ventured into tall grass just the two of us. For the most part, Everett and Carson sat and watched patiently, only occasionally crying out in boredom. We tuned them out for five minutes and kept our eyes mostly on each other, purposefully and intentionally because even though we don't always practice this perfectly, we want our kids to see Us. "Us" being Brett and Ashlee, husband and wife, two people who still love each other after almost eleven years together. It would be easy to let these kids swallow us whole if we let our guard down. They are young and needy right now, and it would be easy to save everything marriage-related for after bedtime. It would be easy to let them interrupt every conversation, to let them leave toys in our bedroom, to let them be in every single picture. It would be easy to let them destroy Us on some days. If we want our kids to respect our marriage, we have to let them see our marriage. We have to let them see our date nights, see us kiss in the kitchen, see us fight and make up. The only way they're going to see Us is if we let them. Or, in the case of annual family photos, if we force them to watch from the sidelines. Some days I think our marriage has never felt more difficult than it does right now. In this demanding phase of parenting two little kids, we have to fight for our marriage every single day---for quiet, for date nights, for intimacy of any kind. Our days are full and messy and exhausting and it's all too easy to give our marriage the leftovers, the 2% of energy we have left at the end of the night. Some people might think it's weird that we take family portraits every year, but I love documenting our kids at this age because they are changing so much. Last year, Carson was barely a peanut in my belly and now he's eating butternut squash from a booster seat. In twenty years, it will be nice to look back at these pictures and remember this year, the year that Everett turned three and said the funniest things, the year that Carson rocked his gummy smile. This was the year we became parents of two and it was damn hard and exhausting as hell, but look at us. We survived, we relayed, we fought and made up 200 times. We made mistakes and apologized and forgave each other and slammed a few doors and offered grace upon grace upon grace. We argued at 3am, watched our boys become best friends, and basically became parents all over again. We re-examined our expectations, had our fair share of living room therapy, and learned to love each other a little bit better. It has not been easy. Some days the pressure and tension in this house could blow up the moon. But even on those days, somehow---by the grace of God---we find our way back. And this is why I always ask for photos of just Brett and I. Because in twenty years, when we look back at these pictures, I will be glad that we stopped for five minutes to remember Us.